Cote d’Ivoire international Bonaventure Kalou could make his debut for his new club Racing Lens as early as Saturday when the team host Ukraine’s Chernomorets Odessa in the second leg of their Inter Toto Cup third round match. Kalou could likely partner his compatriots Kanga Akale and Aruna Dindane in the match, saying he was fit for action but that the decision ultimately rested with coach Guy Roux. “A lot of people desire that I came here, particularly the coach, who I worked well with before,” said Kalou, whose career in France began under Roux’s guidance at Auxerre. he was the main reason that I came here. 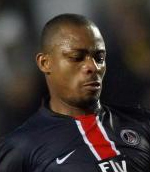 I had other opportunities but my decision was taken very quickly," Kalou said of his move from Paris St Germain. "Racing Lens is a club that has shown its objectives with ambitious recruitment. For me the goal was a chance to play in European club competition. This was as simple as that,” Kalou added.